45When he rose from prayer and went back to the disciples, he found them asleep, exhausted from sorrow. 46"Why are you sleeping?" he asked them. "Get up and pray so that you will not fall into temptation." In the phrase translated "as usual" (NIV), "as was his custom" (NRSV), or "as he was wont" (KJV), the noun is ethos, "habit, usage. "1The Greek phrase means, "according to his habit or custom." Earlier, Luke explains, "Each day Jesus was teaching at the temple, and each evening he went out to spend the night on the hill called the Mount of Olives" (21:37). It was a rhythm of life that week of the Festival -- days in the temple, evenings on the Mount of Olives, located across the Kidron Valley from the city. Notice the phrase, "his disciples followed him." The verb in Greek is akoloutheō, "to follow someone as a disciple, be a disciple, follow. "2The disciples followed him when the crowds acclaimed him and when life was filled with miracles. They also accompanied him -- indeed, were invited to join him -- when his humanity was showing, when he faced temptation in deep turmoil and anguish. Jesus was not a loner-leader, he was a leader who allowed his disciples to be close to him -- even though that openness allowed one to betray him, as followers sometimes do their leaders. The verb "pray" is the common Greek word, proseuchomai. The content of the prayer is expressed by a Greek verbal infinitive, eiserchomai, "enter," figuratively "come into something = share in something. "3Jesus doesn't encourage them to pray that they won't be tempted. They are tempted. Temptation is a fact of human life that neither we nor Jesus can escape. But they pray that they won't "enter into" or give into the temptation. Disciples, how do we resist temptation? Through prayer. That's the simple but vital lesson of this passage. Q1. (22:40-41, 45-46) Why did he ask his disciples to pray? What temptation did Jesus know they would be facing? What was the content of their prayer to be? Did they actually pray this prayer diligently? How does the Lord's Prayer word this kind of prayer? Why do you think Jesus wanted to be alone during his own prayer? Matthew and Mark mention that Jesus takes Peter, James, and John with him, and then moves a bit farther from them, but Luke omits this detail. Luke uses the Greek verb apospaō, "draw or pull away ... withdraw,"4and describes the distance as "a stone's throw." How far is a stone's throw? my precise mind asks. A little ways. Luke doesn't tell us exactly. The point is that Jesus is alone -- within hearing distance, but alone. His posture here is different from any other time we see Jesus. The typical Jewish prayer posture of the day was standing, with eyes open and lifted to heaven.5Here Jesus kneels, perhaps because to reflect his urgency and humility. The Greek expression is "to bend the knees" and is found occasionally in the NT (Acts 7:60; 9:40; 20:36; 21:5; Mark 15:19; Romans 11:4; 14:11; Ephesians 3:14; Philippians 2:10). It is remarkable that we see Jesus in this posture only once, but that in our day kneeling is considered by some traditions preferable over standing for prayer. Our prayer posture should not be decided by tradition but by our relationship and the needs of our communication with God. If standing or walking suits the situation, then that is proper. If kneeling or bowing or lying prostrate fits, then that is appropriate. Most artistic renderings of Jesus in the Garden show him with hands folded or fingers entwined, but I doubt that it was so. I know of no Jewish precedent for folding hands in prayer, and much indication that hands would be lifted in prayer.6The verb for prayer in this verse is the common proseuchomai, "pray." When you can observe a person under pressure, you learn a great deal about him or her. The disciples had the privilege of observing Jesus near the breaking point of intense pressure. Isn't it wonderful that at this point, Jesus' assured address is simply, "Father"? Mark's Gospel includes the more intimate Aramaic word, "Abba." Jesus has a mission, a destiny. On earth, Jesus wasn't all knowing. This was part of the glory of divinity that he had voluntarily laid aside for a time (Philippians 2:7) when he "emptied" himself (Greek kenoō). As a baby, of course, he did not know all things; he learned them (Luke 2:52). As a boy he began to comprehend. In his teen years he knew more (Luke 2:49). And as he prepared for his ministry before and after his baptism, and then in the desert, the Father revealed to him the full scope of the "cup" that he would drink, the destiny to which he was called, the mission he was sent to accomplish. The scriptures spoke to him as his Father interpreted them to him. Q2. 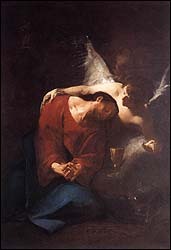 (22:42) Why did Jesus pray that the Father take the cup from him? According to Mark and Matthew, Jesus repeated this prayer three times. Why was he so intense about it? What did this mean? Why was Jesus resisting the Father's will? Or was he? He prays, "Nevertheless, not my will, but yours be done." In this last part of 12:42, the noun "will" is Greek thelēma. By New Testament times, the thelō word group means much the same as the boulomai word group discussed above on 22:42a. In 22:42d, thelēma means, "preference, will. "11The conjunction used here is Greek plēn. It is part of a grammatical construction that indicates "on the one hand ... nevertheless" or "indeed ... but." It is a strong adversative.12In spite of Jesus' petition, this clause stands: Your will is primary, mine is secondary. Jesus yields, submits, surrenders to the Father's decision. Jesus has a preference -- that the cup be removed. But he voluntarily surrenders that preference if the Father's will differs. Q3. (22:42) When Jesus prayed "not my will, but yours be done," was the Father pleased? Why is the Father not pleased when we are passive and uncaring and dispassionate in our prayers that his will be done? What is required for us to pray the prayer of submission with authenticity? Verses 22:43-44 don't appear in a substantial number of ancient Greek manuscripts, though most modern versions include them in the text.13Both verses are remarkable in what they add to the picture of Jesus in Gethsemane beyond the story related by the Matthew and Mark. Q4. (22:43) Did Jesus get "special treatment" because he was the Son of God to have angels help and strengthen him in his spiritual struggle? Do we get that help, too? Unfortunately, he does not find it in those closest to him. They have fallen asleep. Luke gives us the telling phrase, "exhausted (koimaō, "sleeping") from sorrow." Have you ever wept and grieved so much that you become exhausted by it? Have you ever been under such stress that you live in a state of exhaustion? They, too, are suffering grief, Greek lupē, " 'grief, sorrow, pain' of mind or spirit, 'affliction. '"21They have heard their Leader agonizing a few steps away; they can sense his struggle and are bewildered at the same time as they are grieved by it. Jesus' words, of course, fit your situation and mine, too. Were the disciples sleeping? Yes, literally, but too often we sleep spiritually. We don't watch. We don't tarry in prayer. We don't stay spiritually alert. And we don't "arise" (Greek anistēmi, "stand up, get up"), as Jesus urged his disciples to do in the Garden, but are content with our spiritual sloth. The way of the cross was far more costly for Jesus and his Father than we can possibly imagine. It is quite appropriate to state to the Father our own will in a given situation. We can wrestle with God when something troubles us, so long as we can sincerely pray the prayer of submission along with it. Even strong men and women must learn to voluntarily bend their wills to the Father's. Angels can assist us when we are struggling in prayer. Leon Morris, The Gospel According to St. Luke (Tyndale New Testament Commentaries; Eerdmans, 1974), p. 311. I. Howard Marshall, Commentary on Luke (New International Greek Testament Commentary; Eerdmans, 1978), cites Strack and Billerback II, 259-262 for examples of prayer while standing. So Marshall, Luke, p. 831; and Leonhard Goppelt, "potērion," TDNT 6:149-153. Gottlob Schrenk, "thelō, ktl.," TDNT 3:44-62. Joel B. Green, The Gospel of Luke (New International Commentary on the New Testament; Eerdmans, 1997), p. 780.